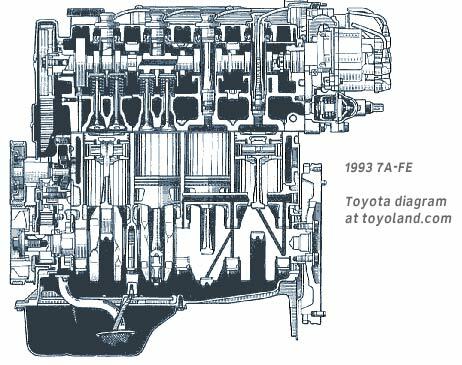 The 4A engine series was a 1587 cc (1.6 liter) engine, introduced in 1988, and revised to 4A-FE in 1993; it was mainly used in the Corolla, and was replaced by the ZZ series in the 1998s. The 7A engine series was essentially the same engine, stroked for higher displacement (1.8 liters) and better torque. The torque curve was fairly flat, with a steep, linear horsepower curve. The 4A-FE, by 1993, was producing 105 hp @ 5,800 rpm (75 kW) and 100 lb-ft of torque at 4,800 rpm (136 Nm). In California trim, it produced 100 hp (86 kW). It was a compact DOHC engine for good economy and good driving characteristics. The 7A-FE boasted an extra 10 horsepower and 15 lb-ft of torque, engaging at a lower rpm (110 hp in California); in metric terms, it pushed out 82 kW and 156 Nm. In 1993, the 4A-FE was given better intake efficiency through use of upright, small-diameter intake ports in the cylinder head, increased valve lift and intake valve diameter; a rotary solenoid type idle air control valve; and a large aluminum stiffener and vanadium-steel crankshaft to reduce noise and vibration. 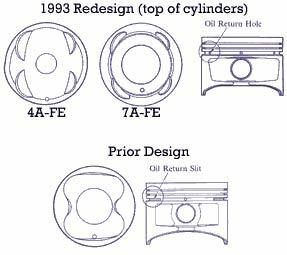 When the 7A-FE was designed, it was given the same improvements as the 4A-FE, as well as a knock sensor. Both engines shared a pentroof type combusion chamber, with cross-flow manifolds. At the same time, one of the five original engine mounts in the Corolla was dropped, leaving four; but the right-side engine mount were revised, to a cylindrical, shaft-type liquid-filled compound type to reduce vibration and noise. Unique to the 7A-FE were two-layer metal head gaskets, and a two-piece oil pan (one piece of aluminum alloy, the other of steel; the upper pan was secured to the cylinder block and transaxle housing). The crankshaft and connecting rod specifications were modified to match the longer piston stroke and higher power output of the 7A-FE engine, and the pistons were made more rigid by modifying the oil return from the slits to 8 holes. The valve details were also changed to match the improved performance. The intake diameter was increased from 30.0 to 31.0 mm, the exhaust kept the same size at 24.5 mm, and the lift increased from 6.6 to 7.6 (both intake and exhaust). In previous engines, engine coolant from the radiator flowed to the cylinder block first, then to the cylinder head, but the new engine adopts a cooling system in which the intake side is cooled first. After the engine coolant cools the intake ports of the cylinder head, it then cools the cylinder block and cylinder head. By using this cooling sequence, the intake air temperature is reduced and knocking resistance and volumetric efficiency are improved. The shape of the exhaust manifold was changed to match the newly-adopted WU-TWC manifold converter. In addition to a knock sensor, the 7A-FE had a torque management feature which cut torque while the automatic transmission shifted to minimize harshness. The fuel injection system was changed from a somewhat inefficient all-firing-at-once system to a more modern two-at-a-time system, now just one step away from sequential injection. Timing was changed so that the intake closed at 38° ABDC instead of 34°, exhaust opened at 42° instead of 37°, and exhaust closed at 2° ATDC instead of 3°. Intake valve opening remained at 6° BTDC as it had been in 1992. A plastic region-tightening method was used for cylinder head bolts to eliminate the need for periodical inspection of bolts. Along with the revamping of the intake system, the two resonators in the air cleaner hose were cut to one. Switching to a rotary solenoid-type idle control valve meant that the idle-speed adjusting screw could be eliminated. In addition, a brace between the head and throttle body was added to reduce vibration. The intake air chamber and intake manifold could now be separated to provide easier access to injectors; an equal-length intake manifold was used to reduce intake air noise; and metal gaskets were used for the intake manifold and intake air chamber gaskets to improve seal performance. The shaft type mount was rotated 90° from the previous mounting position. This causes the rubber in the mount's shear direction to be the soft direction, thus reducing engine noise and booming noise. In addition, the rubber in the mount's compression direction was in the hard direction, improving the vehicle's drivability. By reducing the dynamic spring constant in the high frequency range, the cylindrically shaped liquid filled compound mount reduced vibration and noise. The damping coefficient in the low frequency range was made larger, thus improving drivability and riding comfort. The newly-developed liquid filled compound mount had an insulator filled with a fluid. The fluid inside the fluid chamber reduced the dynamic spring modulus in the high-frequency vibration range and thus increases quietness in the passenger compartment. The flow of fluid within the orifice increased the damping coefficient and thus suppressed engine vibration. The engine control system for the new 4A-FE and 7A-FE engines had the same basic construction and operation as the engine control system in the previous 4A-FE engine. A test mode function was added; in the 7A-FE engine, a knocking correction function using a knock sensor was also added. The throttle position sensor went from being a point type to a linear type; the oxygen sensor continued without a heater, but a second oxygen sensor was added to check up on the first one; the rpm sensor was chagned form a single pickup coil with 24 teeth to dual four-tooth coils; and the crankshaft position sensor was changed from a single coil with four teeth to a single-tooth coil. The cooling system reached the bottom of the intake port first to reduce intake air temperature, improving knock resistance and efficiency. There was originally a cold-start injector in the 4A-FE, but this was eliminated in 1993.